Navaratri is one of the widespread festivals in most of the states including Karnataka. In Karnataka, Navaratri is celebrated by lighting up Hindu temples, traditional sites, majestic processions and of course Sattvic food. It is locally called Dasara, and it is the state festival of Karnataka. Of the many celebrations, the Mysuru Dasara is a major one and is popular for its festivities. Another Navaratri tradition in Karnataka has been decorating a part of homes with art dolls called Gombe. 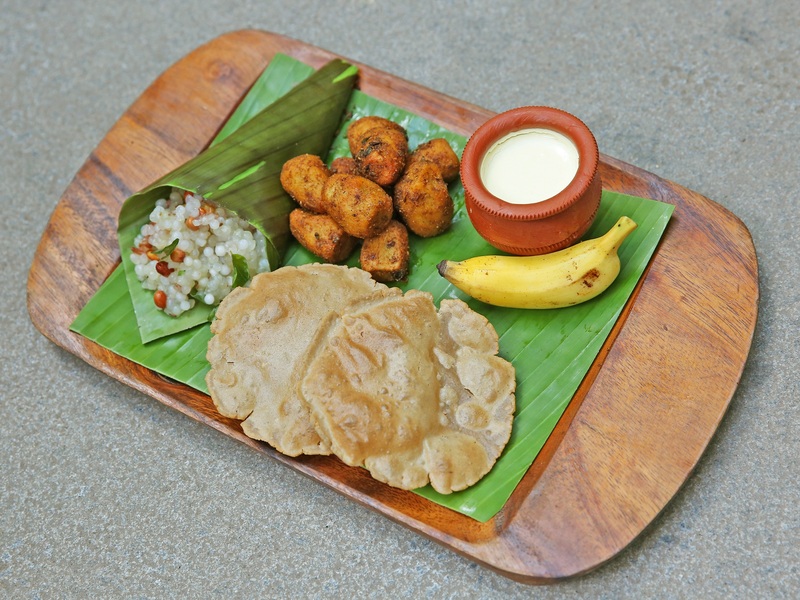 Tribute to the Navaratri and cultural cuisine, Cubbon Pavilion at ITC Gardenia has come up with Navaratri Special Thali which was started from 21st September and goes till 29th September. I was one among in the preview to experience the exotic thali which has healing benefits; the vegetarian thali is finely crafted with traditional sattvic dishes. An evening was well spent with some fruitful conversation with Chef over the cheerful Sattvic Thali. Well, the meal is comprises of Sabudana vada, Sookhi Arbi, Kache kele ki subzi, Methi Paneer, Sabudana Khichdi, Koottu Poori, Koottu Paratha, Koottu Halwa, Curd, Soma Rice, Boiled Sweet Potatoes, Cherry Banana. In preview, I felt all these dishes were exceptionally good with traditional touch! As I mentioned earlier, all these dishes were exception of Onion, Garlic, rice, wheat flour, maida, Sooji, turmeric, asafoetida, garam masala and dhaniya powder. One must certainly experience the Thali. The service was just excellent; folks were knowledgeable and capable of answering about the dishes being served. Get inspired to attain a complete sense of physical, mental and spiritual well-being. Healthy Eating has never been this delicious! Note: This write-up is completely based on my experience and not influenced by anyone, though it was an invite.